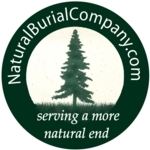 Any funeral service provider can help you get a natural coffin from the Natural Burial Company, and most are willing to help you with natural funeral services, too. If you're having trouble finding one, visit the Natural End Map. If you just want to look at the "stuff", come over to our ONLINE STORE. The natural burial movement is still new to North America, and finding a funeral service provider who will support environmentally friendly options can be a challenge. However, you might be surprised to learn that there are a lot of funeral service providers out there who are prepared to support families who want an environmentally friendly funeral.